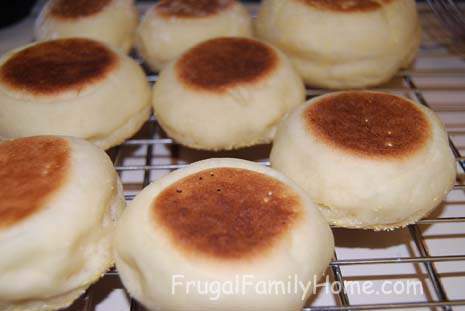 I was reading over at Money Saving Mom about how she made some English Muffin. Well that got me to thinking that English Muffins sound really good. I have made them in the past but not recently so I went ahead and made a batch today along with some more bagels for the freezer. I used the same bagel recipe that I used to when I was doing my freezer cooking last month. They turned out really good today. Don’t they look yummy? I also made a batch of English Muffins. I found the recipe over at The Frugal Girl. I will post about how to make these next week but I couldn’t wait to share about them. These are so good. 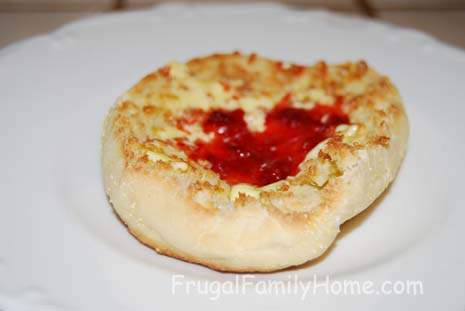 If you make these English Muffins at home I am sure you will not want to go back to store-bought again. Here is the lovely muffins all done. I used my small biscuit cutter but next time I will use the large one. The recipe said it make 18 english muffins but I got 30 out of one batch. They are on the small side but oh so good. Of course I had to sample one so I added my homemade strawberry jam. I placed half of the bagels and half of the english muffins in freezer bags and put them into the freezer for later this week or for later this month. I am not sure how long either of these will last in the freezer. 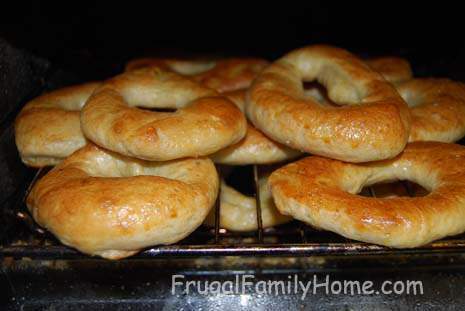 Crystal at Money Saving Mom got me to craving them when she mentioned making them. Some of the ones from the store have milk so I usually make them but it has been a while. These are so much better than the store bought ones. Those look terrific, now to buy a biscuit cutter….wonder if a glass would work? A glass would work fine. I used to use one until I got a biscuit cutter.